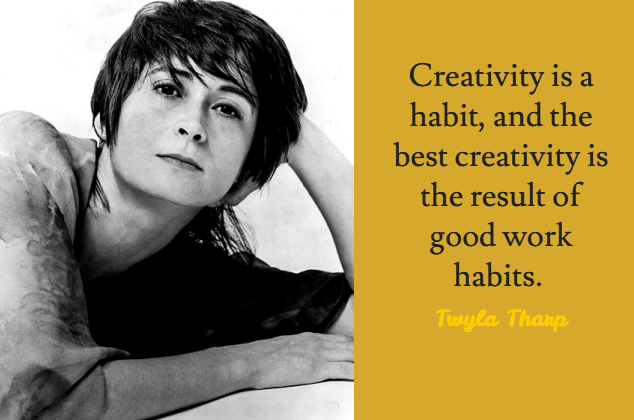 I love this creative quote by Twyla Tharp. She is talking from experience. And if you read her book 'The Creative Habit' you will take this advice even more seriously. Yes, creative habits make us successful as creative people. We creative people are crazy. That's what others think about us. But we too get into the same thinking trap. We say, "You know, I am not in a mood to create today. And when I am not in that creative zone, I just can't create good stuff." Or, we utter some other crap like that. Waiting for the muse, getting into the zone! These are all excuses. Great creative minds follow a disciplined routine. They set their creative habits. A schedule and goals for their creative work. Yes, it may not be 9 to 5 kind of discipline, but there is a method to their madness. They may work through the middle of night, or in the early wee hours, but they work on their stuff on regular basis. Even when the 'creative block' faces them like a monster. We all know the truth, the inspiration doesn't hit us every single day. That big idea which will make you world famous will only hit you thrice in a life time. But when the idea hits you, will you be ready to catch it? And will you have the skills and capabilities to execute it wel? Will you have the patience and the rigour to make that idea alive? Idea is only one part of the creative equation. Good work habits make us competent to bring those ideas to reality. These creative habits will become our path to the creative zone. The creative geniuses work more than others. They put more sweat into their paintings, more breath into their singing and more dirt into their sculptures. Idea is only one part of the creative equation. Good work habits make us competent to bring those ideas to reality. Creative Culture Makes The Real Difference!